Gummy Rat: Deliciously gross gummy rodent. 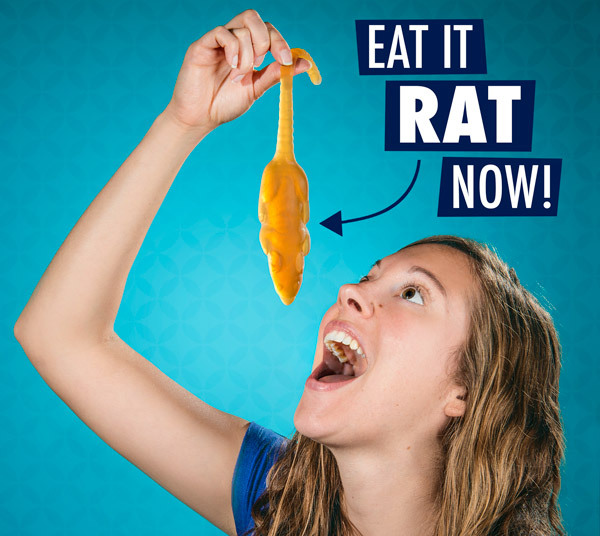 You’ll welcome an infestation in your life when it tastes as good as the Gummy Rat. These candy vermin have the gross detail of their real-life counterparts from a tiny scavenging nose to a long, ribbed tail. 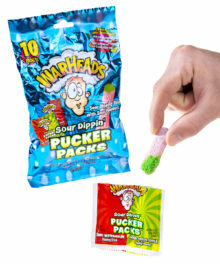 Thankfully that’s where the similarities end since these treats are made of pure, delicious gummy. Whether you think rats are kinda cool or pretty ewww, you’ll love the 8+ inches of fruity flavor packed into the Gummy Rat. 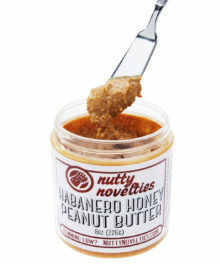 Because we receive this item in an assortment of flavors, we must sell them randomly. You will receive either orange, cherry, or grape. Please note: This item cannot be shipped outside the US. When you see a rat on your plate, it usually means you’re in a crappy restaurant (or maybe a computer-animated movie). But when the rat is made of fruity gummy, it means you’re in luck. 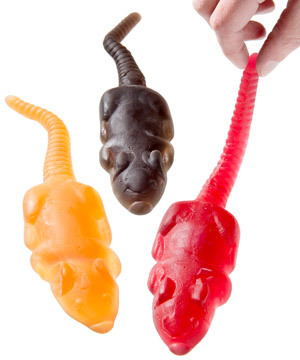 The Gummy Rat is a tasty treat modeled after the ubiquitous rodent. The gummy has enough realistic detail to look like the creature but not enough to stop you from chowing down. You’ll be ready to rip open the package and grab hold of your snack—no traps required. 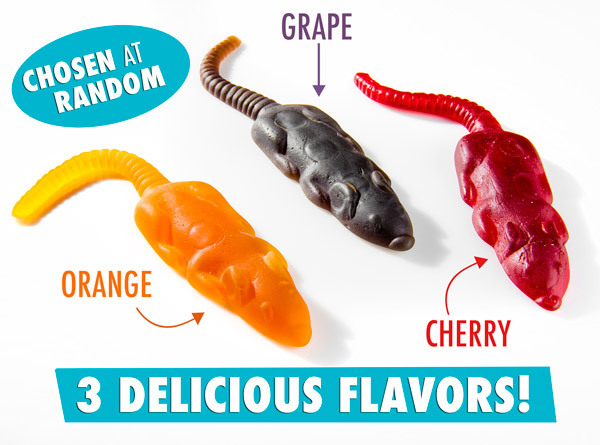 The Gummy Rat is available in three tasty flavors: orange, grape, and cherry. 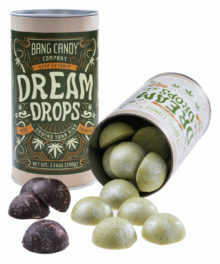 Due to the way we receive the candy, we can not take requests for specific flavors. However, we tested each variety (and retested for… um… quality control) to confirm that they are all delicious. No matter which flavor you get, you’ll want to channel your inner python and devour this thing whole. As you’re eating your sugary snack, make sure to check out the card inside the package which contains real facts about rats. Who knew education could be so tasty? 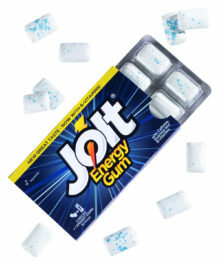 A candy worth running a maze to get. Question: How do I select my flavor? Answer: Because we receive the Gummy Rat in an assortment of flavors, we must sell them randomly. While you can’t choose a specific flavor, you are guaranteed to receive a delicious fruit flavor (grape, cherry, or orange). Question: How much of my daily serving of rat meat is in each gummy? 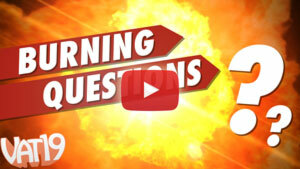 Question: Since it’s made with kosher gelatin, does that mean it’s different from your other gummy? Answer: Yes. The Gummy Rat is made by Jelly Belly. You may notice a slight difference in taste and texture compared to some of our other gummy products. You may also notice that it’s still delicious.